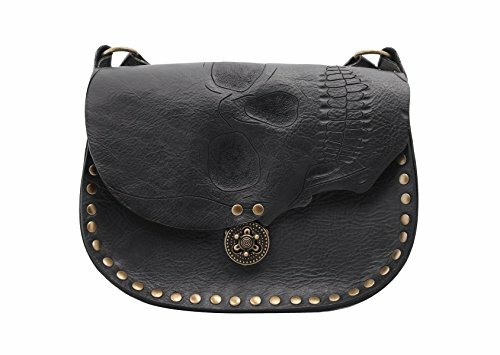 This listing is for a cross body black purse with a skull hand carved and tooled on to the leather. Constructed by hand, hand dyed and hand carved, from sustainable ethically sourced leather this truly is a functional piece of wearable art that will last and last. Color- black hand dyed leather with silver rivets and hardware. Gold is available upon request. The finished dimensions of the purse are approximately: 10.5 x 7.75 x 3.25 The straps adjust on both sides of the purse and go from 49" to 55" Want your initials to customize this purse and make it your own? This can be done! Up to 3 initials free. If you have any questions about this product by Skrocki Designs: fine leather and artisan jewelry, contact us by completing and submitting the form below. If you are looking for a specif part number, please include it with your message. Willamette Crossbody in cowhide and full grain leather by Meant Mfg.